There are multiple departments within a retail organization, so which are most important? If we’re equating worth to cost — i.e., the annual salaries of employees within each department — then supply chain executives are most critical (see chart below). 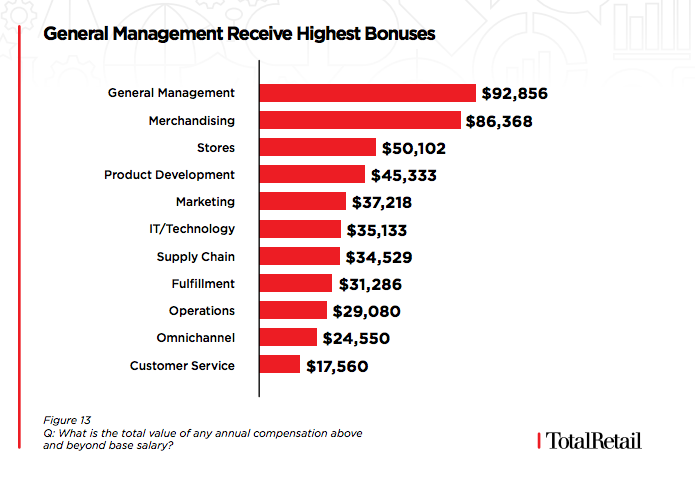 This was just one of the findings of Total Retail’s recently released 2018 Salary Benchmark Report, which included the results of an online survey sent to the brand’s audience earlier this year. Supply chain executives are tasked with partnering with buyers, planners and vendors to develop strategies to reduce supply chain expenses while also increasing sales, gross margin dollars, and profitability. Therefore, their average annual salary of $145,724, the most of any department, makes sense. In fact, supply chain execs are receiving a salary nearly 12 percent higher than the next closest department, merchandising. Merchants receive an average annual salary of $129,467.